SAN DIEGO — Celebrating its ninth year, the San Diego Yacht and Boat Show will feature more than just boats on the water, as it has become a place for those new to boating to experience the “boating lifestyle” firsthand. Running from July 26-29, the Harbor Island-based show has grown over the years, becoming a summer event where boaters can check out the newest lines of vessels. And it has also developed into a destination where visitors can get a hands-on taste of the boating experience, test drive boats, explore the latest marine accessories and enjoy a day on the water. This year, more than 100 boats and watercraft can be viewed in both in-water and on-land displays, ranging from personal watercraft and entry-level family cruisers to luxury motoryachts and sailboats. Highlights at this year’s show include a 79-foot Johnson cockpit motoryacht from Orange Coast Yachts, featuring a custom interior, four cabins and a full crew stateroom and lounge area. The $3.9 million yacht is sure to turn heads. Those who are not yet in the market for a luxury yacht will also find plenty to see and do here. A scuba dive pool will be open to those looking to learn the ropes of scuba diving; multiple boating seminars are scheduled; and a new Try It Cove will be open for boat show visitors to try out paddleboards, kayaks and other marine toys. The show is scheduled from noon-7 p.m. July 26-27, 10 a.m.-7 p.m. July 28 and 10 a.m.-6 p.m. July 29. Admission is $12 for adults and free for children ages 12 and younger. Military personnel with proper identification are admitted free. 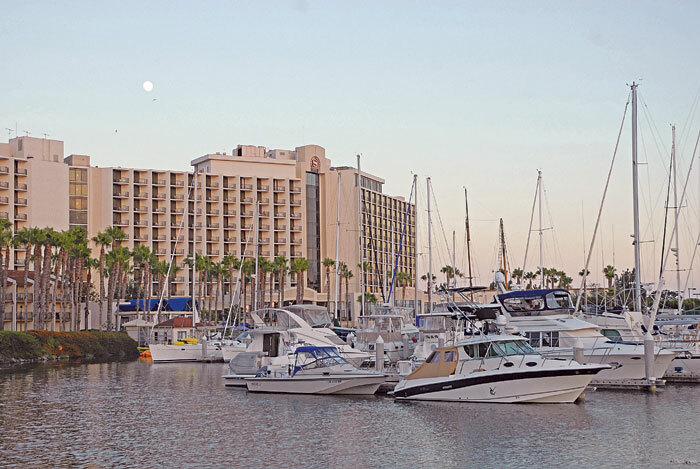 The show will be held at Sheraton Marina at Harbor Island, 1370 Harbor Island Drive, San Diego. It is produced by NMMA West. For more information, visit sandiegoyachtandboatshow.com. * Learn to SCUBA at the DEMA “Be a Diver Pool” — Show-goers can learn how to scuba dive with a certified instructor at the heated pool. All that is needed to participate is a swim suit. Scuba gear, changing rooms and hair dryers will be supplied. Participants can also get a photo taken underwater, as a keepsake. For ages 10 and older. * Try It Cove — Sponsored by West Marine, the cove is the newest feature at the San Diego Yacht and Boat Show. Attendees can try out stand-up paddleboarding (SUP), kayaking, water toys, inflatable rafts and more. There will be changing rooms and towels provided, to give everyone a chance to try and experience time on the water. * Take the Helm at the Discover Boating Dock — Discover Boating has put together a selection of on-water learning events designed to add more fun and excitement to the boat show experience, while giving show-goers a chance to brush up on boating knowledge and skills. The training opportunities will include hands-on skills-building instruction on powerboating and sailing. Both beginning and advanced courses will be offered, and boaters can register online at sandiegoyachtandboatshow.com or at the show. A registration fee of $10 is required for each session and includes complimentary boat show admission for the day. Participants must be a least 18 years of age. * Meet Skipper, the Boating Dolphin — Returning to San Diego by popular demand, Skipper will be available for photo opportunities. * Wing-Eating Contest — Show-goers can cheer on contestants as they compete in a buffalo wing-eating contest, hosted by JACK-FM, with wings provided by Hooters, at 1 p.m. July 28.